Everyone are waiting for the Xiaomi Mi Max 4 phablet smartphone which is to be launched later in 2019. So to give some information about the upcoming smartphone, a new report has came. The fourth generation handset will have a dual rear camera setup same as of Redmi Note 7. This year Xiaomi is giving two Mi Max 4 variants i.e. the standard variant and the premium version- Mi Max 4 Pro. As per the reports, the primary lens of the Mi Max 4 will be ISOCELL GM1 48MP sensor of Samsung. Reports also stated that the smartphone will support Super Night Scene camera mode of Xiaomi. The main difference between the standard variant and the Pro is the processor. The Mi Max 4 will most probably be powered by Snapdragon 660 while the Pro variant will have a Snapdragon 675 chip. The Mi Max 4 Pro is expected to have a 20MP and 48MP dual rear cameras from which the primary camera will use the Sony IMX586 sensor and there is also an in-display fingerprint scanner for security. The Xiaomi Mi Max 4 smartphone will sport a 7.2-inch display with 1080 x 2340 pixels of screen resolutions. It runs on Android 9.0 Pie out of the box. The smartphone is powered by Octa core (2.2 GHz, Quad core, Kryo 260 and 1.84 GHz, Quad core, Kryo 260) processor. In terms of optics, the Xiaomi Mi Max 4 at the rear has 48 megapixel primary sensor and 5 megapixel secondary sensor. Other sensors include Gyroscope, Accelerometer, Proximity sensor and Light sensor. The smartphone comes with 4GB RAM and 64GB of internal memory which is expandable upto 256GB via microSD card slot. It packs huge 5,800mAh and comes with the fingerprint sensor for security. The smartphone has Adreno 512 GPU graphical performance for better gaming experience. 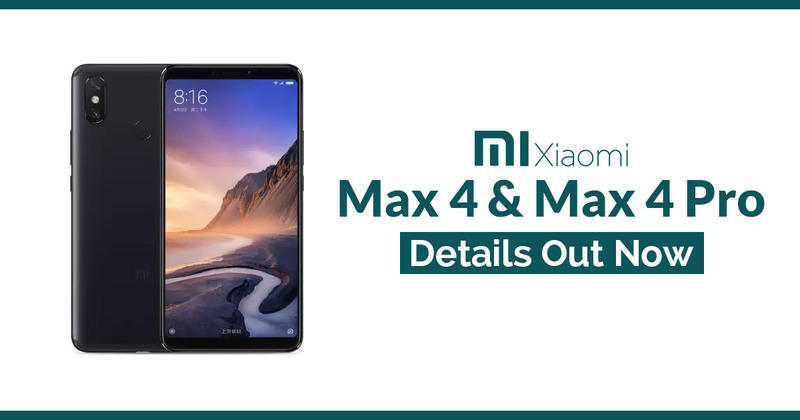 The Xiaomi Mi Max 4 Pro smartphone sports the same 7.2-inch display with 1080 x 2340 pixels of screen resolutions as of Xiaomi Mi Max 4. It runs on Android 9.0 Pie out of the box. The smartphone is powered by Octa core (2 GHz, Dual core, Kryo 460 and 1.7 GHz, Hexa Core, Kryo 460) processor. In terms of optics, the Xiaomi Mi Max 4 Pro at the rear has 48 megapixel primary sensor and 5 megapixel secondary sensor Exmor-R CMOS image sensor which supports a resolution of 8000 x 6000 Pixels while the front camera has Exmor-R CMOS image sensor. Other sensors are Gyroscope, Accelerometer, Proximity sensor and Light sensor. The smartphone comes with 4GB RAM and 64GB internal storage which is expandable upto 256GB via microSD card slot. It packs huge 5,800mAh battery and comes with the fingerprint scanner for security purpose. The smartphone has Adreno 612 GPU graphical performance fr better game experience.